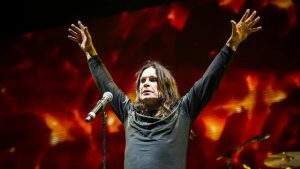 By Danielle Garrand, CBS News | Musician Ozzy Osbourne has been admitted to the hospital after flu complications, his wife Sharon Osbourne tweeted Wednesday afternoon. The announcement comes about one week after the rocker said he would be postponing the entire U.K. and European leg of his current tour. The 70-year-old’s team announced on Facebook last week that the “Prince of Darkness” is postponing the U.K. and European leg of his No More Tours 2 tour per his doctor’s recommendation, following a flu and “severe upper-respiratory infection” diagnosis. “After seeing his physician again, OSBOURNE has been diagnosed with a severe upper-respiratory infection which the doctor feels could develop into pneumonia given the physicality of the live performances and an extensive travel schedule throughout Europe in harsh winter conditions,” posted the performer’s official Facebook account. Osbourne gave his own statement on the matter. In fall 2018, he developed an infection in his hand and canceled the four remaining North American shows in his No More Tours 2 tour. The performances have since been rescheduled for the summer of 2019, reports Rolling Stone.